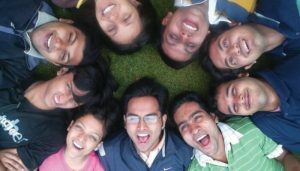 What Makes IIIT-H Alumnus Anand Rathi Click? 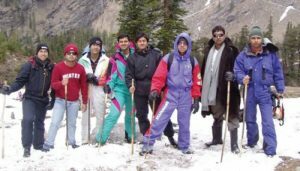 Home / Alumni / What Makes IIIT-H Alumnus Anand Rathi Click? 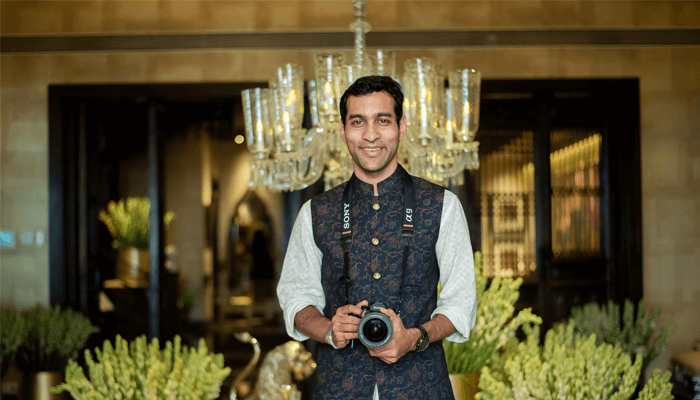 With the recent spate of celebrity weddings, it seems natural to turn our own lens on an acclaimed photographer – Anand Rathi. Ask him if he clicked any pictures from his campus days and he replies in the negative. Yet, this 2008 CSE graduate is an engineer-turned-hedge fund manager-turned-self taught shutterbug. As specialists in wedding photography, his firm is renowned for its “vow” factor. More recently, he has won accolades for covering the wedding of Bollywood actress Sonam Kapoor. Here are edited excerpts from a telephonic conversation with him. I’m from Jaipur, I grew up in Rajasthan. For me, it was pretty straight forward: I wrote my AIEEE exam and got into IIIT-H like most people. I come from a very simple Indian family. My dad was a banker at first, and mother was a homemaker. Then my father became a stock broker. Since my mother was very academically inclined, she was the one who pushed me to pursue quality education and that’s where the whole quest for a good engineering college began. And IIIT-H happened. Were you into photography way back on campus then? Not even remotely. On campus, outside of coursework, I actively participated in basketball: I was the basketball team captain. I was a very active sportsperson. I was also “Mr. Felicity” in my first year. I had a lot of interest in extracurriculars and participated actively in them but not photography per se. I was only exposed to photography much later in life. So, you don’t have pictures shot by yourself on campus? None. Zero. I don’t think my phone had a camera back then. Probably in my final year, my phone might have had a camera. I never had a camera on campus. I have lots of nice memories! I think the most memorable takeaway from the college for me was the fact that we knew everybody on campus, all our teachers and professors knew us by our first names. And that fostered a very inter-personal environment…it wasn’t like a factory-feel. That in turn helps in a lot of ways: academically or in sports or even personality-wise. So IIIT-H did bring about that improvement in me as a person. Among the professors on campus, I remember Prof. Kaul very fondly. He was our first year professor. Kamalakar sir, our Sports teacher is another faculty who I enjoyed interacting with. Can you tell us what you did after graduating from here? 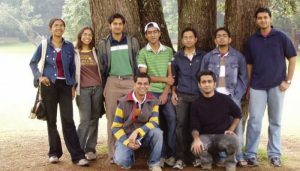 After graduation in 2008, I had an offer from Cisco, Bangalore but I didn’t take it up. I wanted to pursue financial markets so I started day trading stocks for almost a year. Wanting to pursue an education in Finance, I applied to foreign universities and fortunately I got selected to a good one, the University of Rochester. I went to their business school – Simon School of Business. It was during my MBA that I actually picked up a camera. I was getting to travel the country and it was interesting to keep things documented. The technical bent of Computers helped me a lot in playing around with digital photos: going on PhotoShop, doing some tricks and stuff like that. That was still a hobby strictly until I returned to India in 2011. I was with Suzlon Energy managing their Treasury. It was a typical high-stressed, corporate job. But the good thing was that I used to get my weekends off. So that’s when I would be photographing whatever I could fancy right from fashion, to sometimes shooting a friend’s wedding. But all this was on a very casual level. I created a photography page, the typical firstname.lastname/photography: anand.rathi/photography where I used to post my stuff. 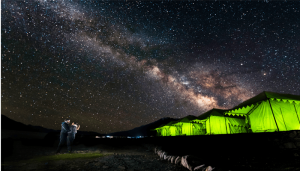 There’s an alumnus from IIIT-H called Sanyam Sharma, batch of 2005 who is now based out of the US and is into photography too. I used to chit chat with him, try and learn new stuff. It was entirely self-taught, YouTube kind of a learning mechanism…I haven’t taken a single photography course in my life. Initially I was doing what everyone else does – photographing sunsets and flowers until a friend approached me to capture his wedding ceremony. I said I hadn’t done that before. He insisted, so I went, clicked pictures and put them up on my Facebook page. People loved it and that’s how I started to shoot more weddings over the weekends until there came a point where I had to make a choice. The number of wedding inquiries had gone up and I decided to give this a shot. That was about 6 years ago. There have been 3 companies so far. My first one was called PhotoSutra. Very soon, I went into a partnership and it was renamed as KnotInFocus. This went on for about 2 years and we enjoyed good success. Then my partner moved out of the city so I had to rebrand and ReelsnFrames has been in existence since the past 3 years. Why the focus on weddings? Free food and free travel! For real. We have travelled to 5 continents over 20 countries for shooting weddings. It gives you the opportunity to meet so many interesting people in so many different parts of the world. Wedding photography as a genre combines so many things – when you are shooting decor, you are shooting like an architectural photographer, when you are shooting people, you are shooting like a portrait photographer, when you are shooting activities, you are shooting like a photojournalist. What has been your quirkiest or most unique wedding shoot so far? A bunch of things..really..One of our clients was interested in shooting underwater and I actually thought she meant in the pool. I agreed and it turned out later that she meant underwater like scuba diving. I actually learned scuba diving for that shoot! We’ve made some really cool tech stuff over the years. We were the makers of India’s first 360 degree wedding films, virtual reality wedding films. We’ve managed to keep pushing our own barriers in a lot of ways over the years. What sort of technology do you use? Tons of tech. In the case of computers, there are some things that can be done only on high-end computers, but it really depends on the programmer or coder as to what he or she is trying to make out of it . So, high-end cameras are like that. It depends on the artists as to what they’re trying to make from it. Some of the technology we are using is basically the same cameras that are used in films, the same editing software, more or less the same practices that are used in films. So, when you think of our wedding shoots, they are as close to a film as they can get. People find us from all over the world. Having a digital presence is what helps.There is no categorization of clients but we tend to get a fair bunch of celebrities who are either Bollywood celebrities, or other business conglomerates like Neel Kamal, Aditya Birla, Rosy Blue, Tech Mahindra, McDonalds. 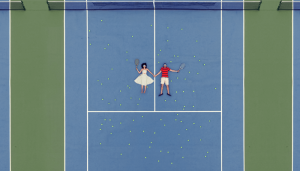 We’ve covered social events for all of them. 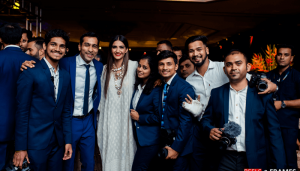 Can you share something you witnessed from Sonam Kapoor’s special day? Simply put, it was the craziest Sangeet I ever witnessed in my entire career. It was one of those surreal things …where you feel like you are literally on the set of the IIFA awards. Even better because the IIFA award is only performances and this was people dancing their heart out in a real-life situation. And the happy/party quotient of that event was off the charts! Lot of fun…lot of activity..
As an engineer, are you on top of the tech game? Yes. The whole point of technology is to make your life easier and pleasurable. Be it a computer program or a digital photo. I’m actually working with somebody who is helping us solve one of the key problems of sharing photos which is, how can professional photographers share pictures that they took of you at an event with you, in a seamless manner. What typically happens is that you never get those photographs back, or never get to see them. We’re trying to solve that problem and quite close to a solution. What advice would you give current or prospective students of IIIT-H? After having a degree from a college like IIIT-H, most of us tend to believe that there’s this burden or loan of education that we have to repay. You have to commit to the education that you’ve taken. But fortunately for me, my father who became a stock broker from a banker, basically became an entrepreneur. So I think it taught him that entrepreneurship can work at some level without you thinking too much of your education. Practical education also comes in handy. What our college teaches us is beyond just writing code and understanding computers. It teaches us the value of staying away from home and managing on our own. We stay in the hostel, live like a small family. It’s not a college that is completely geeky or nerdy but we get an all-rounded education. That helped me as a person to become what I am today. The personality development that happened as a result of exposure to good culture is really the big ‘education’ that I took back from the college. We need to really value IIIT-H beyond the placement statistics. We need to value it for the amazing institute experience it gives us.